terminators for bare and jacketed concentric neutral cables. concentric neutral cables. 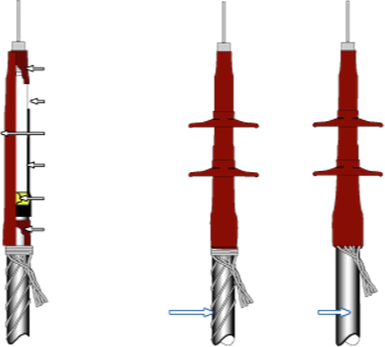 They provide two seals internal to the joint at each end onto the cable insulation shield and a tertiary seal onto the cable jackets at each end of the joint. Selection is Easy: Lookup the conductor size for the voltage class of cable to be spliced. Select the joint part number and confirm that the maximum jacket and maximum connector O.D. are not exceeded; and that the insulation diameter is within the range. This is important if your cable size is at either extreme of the range. Contents include stress gradient mastics, a stress control tube, insulating tube(s) as required, a dual layer (insulating/conducting) tube, sealants, a constant force spring to secure the neutral wires to the joint and an outer wraparound sleeve. Packaging for these kits includes one (1) each, single-phase kit per box. Boxes are labeled in accordance with the requirements of IEEE 404-2000. Connectors for the conductor or for the neutral wires are not included. ﻿Outdoor Terminations are only required when subjected to direct precipitation or exposure to sunlight. The indoor version is acceptable for use in pad-mounted enclosures. the shield grounding are not provided. They must be purchased separately.